I want to renew the foundation plantings on the north side of my house *without* poisoning my Lab puppy, who is still very "mouthy". >>>>>I have a couple things I need to know....Your reference is about foundation plantings,,,How tall would you like the plants, and will it be a single row of plantings or staged with tall in back, short in front. Probably anything between 3-5 feet would be OK. I need to hide the ugly foundation but don't want to obscure one window. I want to do a staged planting and I want it to be mostly evergreen, or otherwise attractive in winter. I don't think there's enough sun for ornamental grasses since this is a northern exposure. >>>>>Also, do you have any idea of the pH value of your soil. I assume that since you have the azaleas, your soil is somewhat acid, But if you know for sure, it will help. Yes, it is definitely acid and I can check the exact pH tomorrow (it's dark now) and look at the height of the window from the ground, too. This is our second Lab puppy to teethe on azalea twigs! (The first lived to be eleven years old, so I don't think it affected him.) The azaleas don't have to stay, though. To start with... doesn't fang know that he's not supposed to mess around with Mom's stuff???? I'm not a puppy shrink, but I think I'd try getting him interested in something else. Have you ever given him a pig ear(mmmm, yummy!) to chew on?? Give him a couple of those every day, and his jaws would be to tired to chew on anything else. Although Azaleas are listed in most of the toxic lists, according to Dr. William Buck DVM. in his article POISONOUS PLANTS AND PETS DON'T MIX, [Quote:] "Although azaleas are deadly to sheep and goats, it doesn't seem to be a problem with cats and dogs." Please keep your azaleas,,,every yard needs a couple of them! The Oakleaf Hydrangea fits your criteria for light, height, and soil pH, but it and all hydrangeas are toxic. Holly (Ilex) berries are poisonous. Skimmia japonica thrives in the shade, grows to 4feet, is not particular about the soil, and is non-toxic. You'll get fragrant clusters of flowers, and if you plant a male and female plant you'll get bright red berries. I haven't ever seen S. reevesiana, but it grows 1 1/2-2ft., has both male and female flowers on the same plant, and gets dull red berries. Aucuba japonica normally grows up to 15feet, but you could keep it pruned if you felt like dealing with it on a yearly basis. Personally, I give Aucuba two thumbs down. (Maybe only one thumb down for A. japonica variegata, the Gold Dust Tree. I couldn't verify whether Acubas are toxic or not. Holly Mahonia, Mahonia aquifolium (4ft.) and Oregon Grape, Mahonia nervosa (1-2ft. ), are two of the plants I would personally use in your situation. Mahonias thrive in the shade, prefer acid soil, and are prickly enough to protect themselves from your puppy. You get pretty flower clusters in spring, and dark purple berries for the birds to eat in the winter! Salal, Gaultheria shallon is another plant that I strongly recommend. It does very well in the shade, likes acid soil, and reaches 1 1/2ft. while spreading an equal distance. It is non-toxic, the leaves are dark green and look like leather, it has spikes of pretty pink flowers in spring, and purple berries for the birds in the fall. You can even make jelly from the berries! Plantain Lilies, Hostas come in a wide variety of shapes, sizes and colors. The flowers are beautiful and usually quite unique. Bugleweed, Ajuga reptens is a nice low growing (3-6in.) ground cover that you might want to consider. It spreads readily, but controllably. It has pretty, purple, crinkled,foliage, and tiny blue flowers on a 9in. spike in the spring. Maidenhair Fern, Adiantum pedatum is a very pretty and delicate looking fern, growing 1-1 1/2 ft. It's probably a little fragile to be within reach of your puppy, but worth taking a look at. Deer Fern, Blecnum spicant is a low growing, dark green fern, growing in a clump 1-2ft. diameter, and 1ft. tall. It's a very durable fern which can grow almost anywhere. 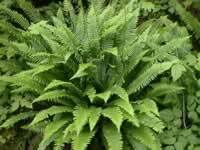 The Sword Fern, Polystichum munitum produces dark green fronds can grow up to 5 feet long. You would have to work at it to kill this fern. No matter how abused this fern gets, you can cut it back, and next year, it'll be as good as new.